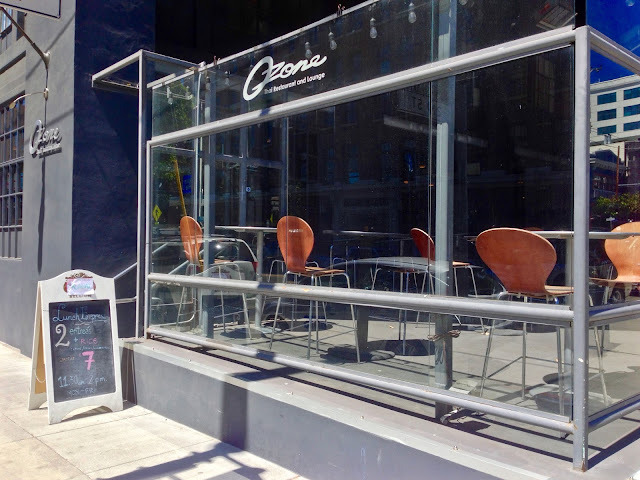 Places I've Eaten: OZONE..AN AFFORDABLE LUNCH IN SOMA! SHOCKING! OZONE..AN AFFORDABLE LUNCH IN SOMA! SHOCKING! Lunch in this town can be a minefield of $10 sandwiches, $12 salads or ye' old fast food. Finding something filling and moderately healthy that won't break the wallet can be a challenge. Particularly in the SOMA neighborhood which is full of tech offices and such. Sure there are tasty places to try, but many are on the pricey side for lunch options. Every now and then you stumble across a place that's only been in your peripheral scope of "I should try that someday." One place is Ozone, sort of a Thai restaurant slash sports bar hybrid with a giant outdoor patio that fills up with Giants fans on game days. It's been in the hood for a few years now and I remember me and the SO having dinner there sometime back, though at the time it didn't really make an impression outside of small portions, big prices. Something lots of Thai places fall into. A year or so ago, they put out a chalkboard sign for lunch that said 2 item plus rice for $7. I remember thinking, hmmm, that sounds like a pretty good deal, I should try that someday. Yeah, everything is someday with me. Once or twice when I remembered about the special I would head over and there would be a long line and really, who has time for that. Then one day, I headed over there round 11:30ish and there were only a few folks, thus my time to try had come. It's basically a hot bar you line up at and then choose either brown or white rice and then 2 of the entrees from a selection of 5, which the server slaps into a to go container for the price of $8 even which I'm just gonna guess is $7 plus tax and whatever. Yes, it was slopped on a little haphazardly but in the scheme of things, she gave me a fair amount of food. 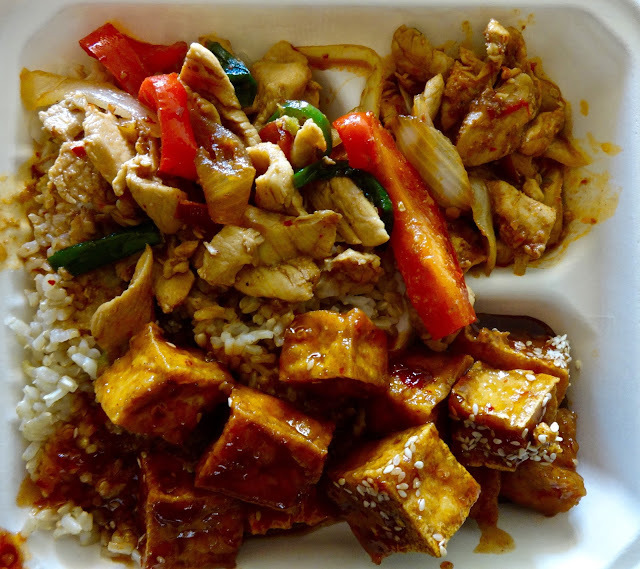 Here we have the Thai basil chicken and some sweet and spicy tofu with brown rice. I know, shocking, I actually got stuff that was kind of healthy and for the most, pretty good. The chicken was tender and spicy with lots of peppers and onions. The tofu was slightly crunchy on the outside and spongy inside. The sweet wasn't too cloying and also had a real red pepper kick to boot. This was a lot better than the stuff I vaguely remember having for dinner here way back when. Even at $8, the cost to quantity and quality ratio is pretty high. And considering this is in SOMA, it's no wonder they get lines for this at lunch time. Filling, mostly healthy, tasty and affordable food is an infrequent commodity in this town and it's nice to have places like Ozone to fill a need in a neighborhood that could use it. I mean even techies cannot live by $12 sandwiches alone! Small side note suggestions are to go a little early or a little later to avoid the lunch rush. If there is a Giants day game, just avoid the place altogether, fortunately the season almost over (come on 2016! ), so you won't have to worry about that too much longer.